This article was originally published on August 11, 2008. I am updating it now to fix some inaccuracies in how this concept was presented. The best way to explain it is to start with an example of where specificity gets confusing and perhaps doesn’t behave like you would expect. Then we’ll take a closer look at how to calculate the actual specificity value to determine which selector takes precedence. Now you want to designate one of these your favorite drink and change its styling a bit. You need a hook for this so you apply it via a class name on the list element. Then you take a look at your work, but alas, it didn’t work! The text of your favorite drink didn’t turn red or go bold! Something fishy is at work here. There is your trouble right there. Two different CSS selectors are telling that text what color and font-weight to be. There is only one statement for font-size, so clearly that one will take effect. These aren’t “conflicts” per-say, but the browser does need to decide which one of these statements to honor. It does so by following a standard set of specificity rules. I think this confuses some beginners because they haven’t quite gotten this sorted out yet. They might think because the .favorite statement is “further down in the CSS” or because the is “closer to the actual text” in the HTML that will be the one that “wins”. The color will be black… but I digress. But that is over the top. It makes your CSS harder to read and yields no real benefits. 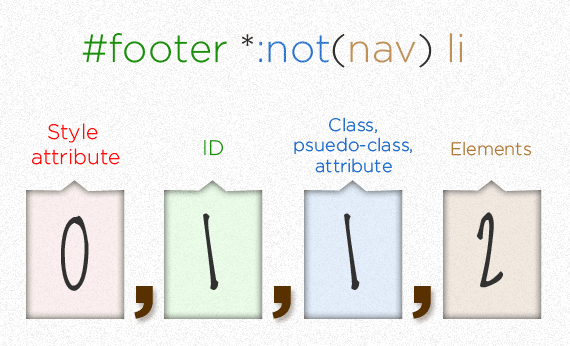 Another way to juice up the specificity value for your “.favorite” class is to use the !important declaration. I once heard it said that !important is like the Jedi mind trick for CSS. Indeed it is, and you can force your will over the styling of elements by using it. But !important imposes that will through drastically increasing the specificity of that particular selectors property. The !important declaration can be easily misused if misunderstood. It is best used to keep your CSS cleaner, in examples where you know elements with a particular class selector should use a certain set of styling no matter what. Conversely, not used just as a quick crutch to override the styling of something instead of figuring out how the CSS was structured and working by the original author. I often use that in situations where there are multiple floated blocks, for the last block on the right in a row. That ensures the last block doesn’t have any right margin which would prevent it from butting snugly against the right edge of its parent. Each of those blocks probably has more specific CSS selectors that apply the right margin to begin with, but !important will break through that and take care of it with one simple/clean class. 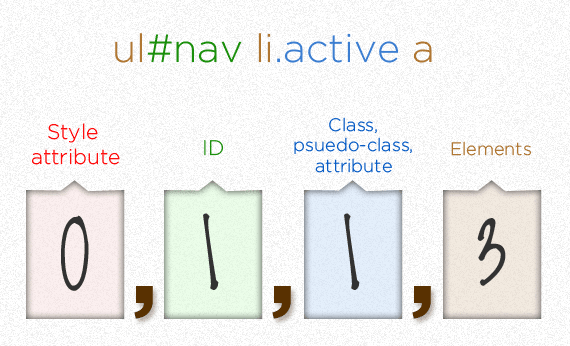 Why is that our first attempt at changing the color and font-weight failed? As we learned, it was because simply using the class name by itself had a lower specificity value and was trumped by the other selector which targeted the unordered list with the ID value. The important words in that sentence were class and ID. 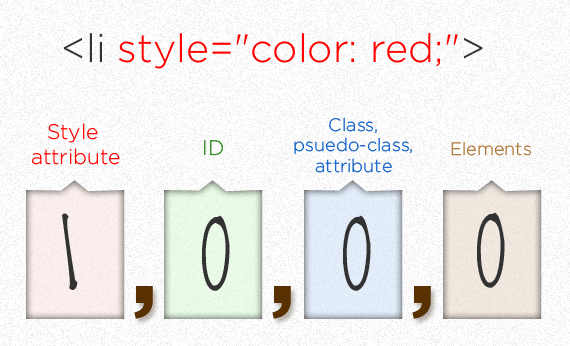 CSS applies vastly different specificity weights to classes and IDs. 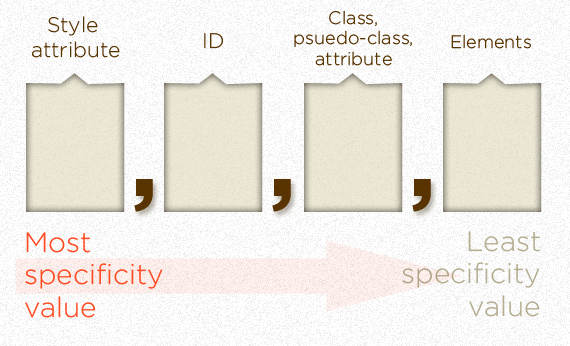 In fact, an ID has infinitely more specificity value! That is, no amount of classes alone can outweigh an ID. 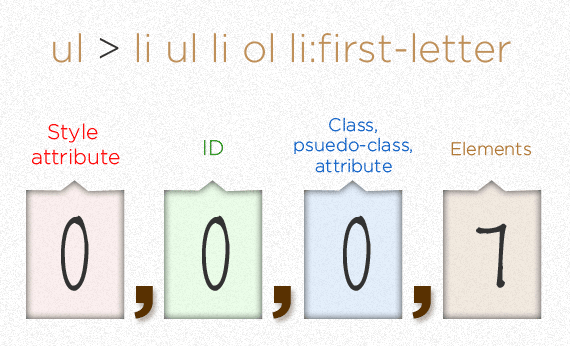 You can generally read the values as if they were just a number, like 1,0,0,0 is “1000”, and so clearly wins over a specificity of 0,1,0,0 or “100”. The commas are there to remind us that this isn’t really a “base 10” system, in that you could technically have a specificity value of like 0,1,13,4 – and that “13” doesn’t spill over like a base 10 system would. 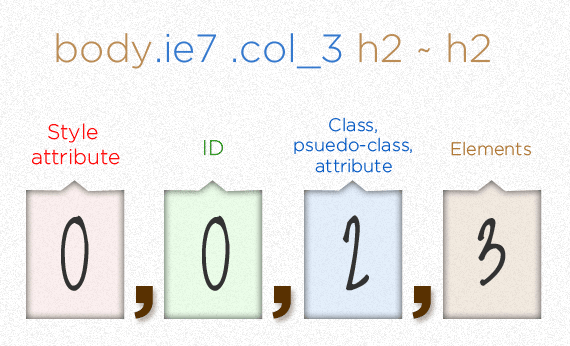 Fuzzy Specificity Hack: IE (even beta 8!) and older Opera browsers have a bug honoring the correct selector under specific circumstances.